The new chicken karaage sandwich with unagi sauce. Changes are afoot at The Gastropig, the Uptown restaurant most famous for its breakfast sandwich, the Baconslut. According to owner Loren Goodwin, though, these changes have been a long time coming. When The Gastropig (2123 Franklin St., Oakland) first opened last year, Goodwin intended to bring on chef Andrew Greene with dinner service in mind. “Dinner was going to be developed within his artistic interests and creative aspirations,” Goodwin explained. But at the time, Greene, formerly chef at Troya in San Francisco, was cooking at Duchess in Rockridge. Meanwhile, The Gastropig found immense popularity as a breakfast and lunch spot, focusing on pork-centric American comfort food. Last month, Goodwin assumed full ownership of The Gastropig as his former partner, Ann Thai, moved on to focus on other projects. The first thing Goodwin wanted to do was bring back that dinner idea — and Greene, who was newly available after Duchess closed three months ago. Now, The Gastropig is open on Friday and Saturday nights. Beer and wine should come within the next couple of months. And depending on how it goes, Goodwin hopes to open at night more days of the week. The initial dinner menu borrows staples from The Gastropig’s lunch offerings, but there are some new dishes that display Greene’s Asian-influenced vision. 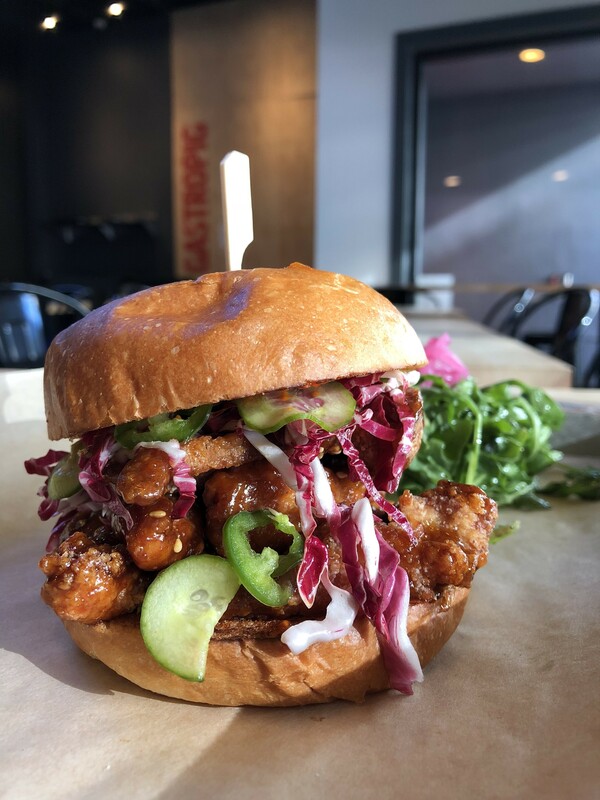 Namely, there’s a new chicken karaage sandwich, which features Japanese-style fried chicken thighs glazed in hickory unagi sauce with pickles and Sriracha mayo on a brioche bun. More menu items are being developed across the board. The collaboration has just begun, so things could certainly change. In the meantime, folks can get a sense of what Greene is all about through his new pop-up, Fine Dining on Paper. The first one takes place April 21 at The Gastropig, with $35 tickets getting you three courses. “It’s his version of trying to do some higher-end food that’s actually cost-conscious, so people who are interested in that type of food actually have access to it,” Goodwin said. And, really, a restaurant known for its breakfast sandwich expanding to evening hours isn’t all that surprising when you consider its owner, who proudly stated he eats breakfast for breakfast, lunch, and dinner.